Skara Sommarland is an incredible water park with heated pools and water attractions for all ages. 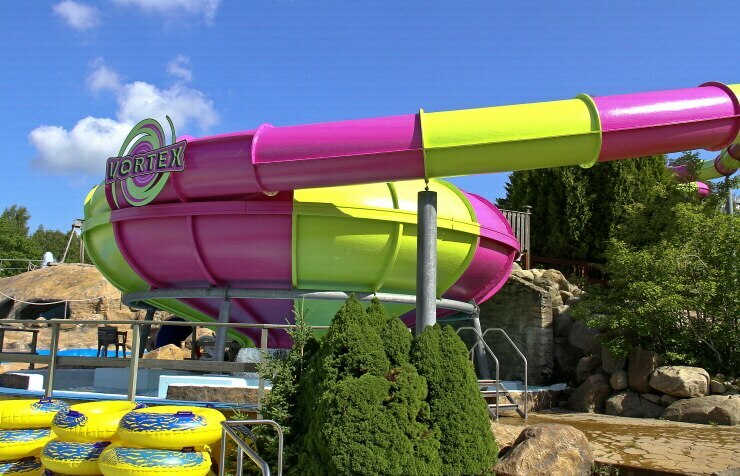 Don't miss out on the 116 meters water slide Cobra. An intense and weightless experience for four people. But there's more. If you want to dry off a bit, you can visit the carnival or challenge the family to a Go-cart race. The park is only a 20-minute car ride from Scandic Billingen. A perfect opportunity to spend fun-filled days with the whole family. From SEK 2,606 per family and night with one extra bed (2 adults and 2 children under 13 years of age). Including entry for everyone with own bed. Note! Additional entry tickets to small children who are sleeping in adults bed are bought separately. Tickets are available to buy at the hotel reception. Between 2-3 and 6-9 June and all days between 16 June-19 August 2018. Subject to availability and number of rooms. May not be combined with other offers or discounts. Bookings can be changed or cancelled up until 18:00 on the day before arrival. Payment in conjunction with stay. Entrance tickets to be received at the hotel.